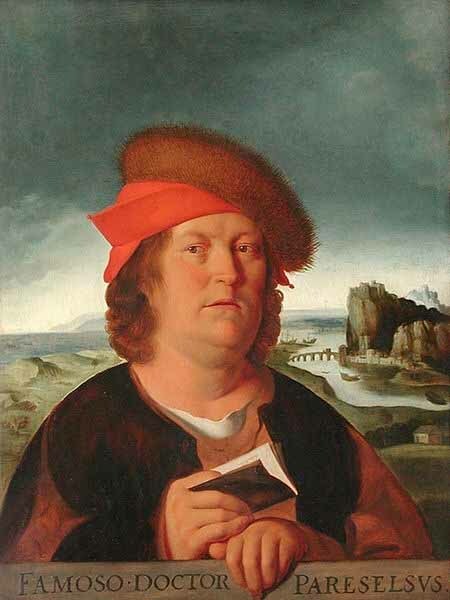 Paracelsus (born Philippus Aureolus Theophrastus Bombastus von Hohenheim November 11 or 17 December 1493 September 24, 1541) was a German-Swiss Renaissance physician, botanist, alchemist, astrologer, and general occultist. "Paracelsus", meaning "equal to or greater than Celsus", refers to the Roman encyclopedist Aulus Cornelius Celsus from the 1st century, known for his tract on medicine. He is also credited for giving zinc its name, calling it zincum, and is regarded as the first systematic botanist. Paracelsus was born at Einsiedeln, Switzerland, of a Swabian chemist father and a Swiss mother. He was brought up in Switzerland, and as a youth he worked in nearby mines as an analyst. He started studying medicine at the university of Basel at the age of 16. There is speculation he gained his doctorate degree from the University of Ferrara. He later journeyed to Egypt, Arabia, the Holy Land, and Constantinople seeking alchemists from whom to learn. On his return to Europe, his knowledge of these treatments won him fame. He did not go along with the conventional treatment of wounds, which was to pour boiling oil onto them to cauterize them; or if they were on a limb, to let them become gangrenous and then to amputate the limb. Paracelsus believed the then-ridiculous idea that wounds would heal themselves if allowed to drain and prevented from becoming infected. Paracelsus rejected Gnostic traditions, but kept much of the Hermetic, neoplatonic, and Pythagorean philosophies; however, Hermetical science had so much Aristotelian theory that his rejection of Gnosticism was practically meaningless. b.) Flamel's theories are specifically alchemical and not magical); Paracelsus did not think of himself as a magician and scorned those who did, though he was a practicing astrologer, as were most, if not all of the university-trained physicians working at this time in Europe. Astrology was a very important part of Paracelsus' medicine. In his Archidoxes of Magic Paracelsus devoted several sections to astrological talismans for curing disease, providing talismans for various maladies as well as talismans for each sign of the Zodiac. He also invented an alphabet called the Alphabet of the Magi, for engraving angelic names upon talismans. Paracelsus pioneered the use of chemicals and minerals in medicine. He used the name "zink" for the element zinc in about 1526, based on the sharp pointed appearance of its crystals after smelting and the old German word "zinke" for pointed. He used experimentation in learning about the human body. Indeed, the remnants of alchemical traditions can still be seen in modern medicine. For instance, the Caduceus has been adopted as the prime symbol of western medicine. Paracelsus gained a reputation for being arrogant, and soon garnered the anger of other physicians in Europe. He held the chair of medicine at the University of Basel for less than a year; while there he angered his colleagues by publicly burning books by other physicians. He was forced from the city after having legal trouble over a physician's fee he sued to collect. He then wandered Europe for some time, typically as a pauper. He revised old manuscripts and wrote new ones, but had trouble finding publishers. In 1536, his Die grosse Wundartzney (The Great Surgery Book) was published which enabled him to make a short comeback in popularity. After his death, the movement of Paracelsianism was seized upon by many wishing to subvert the traditional Galenic physick and thus did his therapies become more widely known and used. His motto was "alterius non sit qui suus esse potest" which means "let no man belong to another that can belong to himself".